Texas Freckles: Hexagon Thoughts :: Week Eight :: Cheater, cheater!! Hexagon Thoughts :: Week Eight :: Cheater, cheater!! I know I said I wasn't going to use the same fabric twice in my hexagon quilt, but when I saw this Lecien La fille de Pooh-tan today, I decided I'm going to be a cheater. 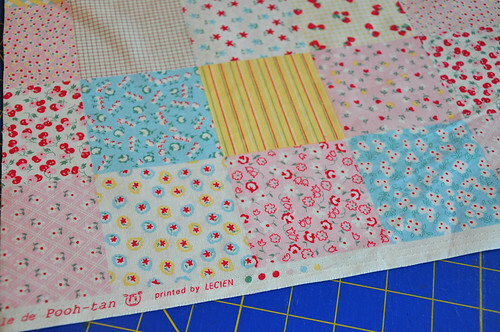 This cute cheater patchwork is made up of 20 precious prints. I trimmed it into 3" squares and then down to 2.5" squares for my one inch hexies. I guess when a fabric is really nice (and I think all Lecien fabric is really nice), maybe it's okay to cheat. Y'all just don't tell anyone I cheated, okay. I'm not planning on cheating any more after this, but if you want to, cheater prints like this would be a great way to add unique charms to your quilt. Do you want to be a cheater too? This 15 x 12" swatch contains 20 different prints. Would you like to have it for your hexagon project? Leave a comment asking nicely and I'll draw a name on Monday evening (after dinner, Texas time). Good luck! What a cute cheater print! Shh! I won't tell anyone but actually no one will know 20 different prints came from the same fabric. Can I please be your winner? Pretty please? Pretty please with cherries on top? me me! that's a great cheater print! That's such a good idea, cheater prints for hexie projects! Thank you so much for sharing with us! Ohhh I LOVE cheater prints! I never thought of chopping one for squares- Duh!!! This is awesome! What a great fabric! I don't think that's cheating at all! You are just "re-defining" your rules! I'd love to win a piece - thanks for offering it to one of us! What an inexpensive way to get a lot of varied squares. Love it! That is so cute, I would love it! THanks for the chance! I just lecien fabrics! Can I please cheat with you? Dial me in for the fun!! so sweet, i'd gladly be a cheater! Pretty pretty please pick me!!!! Oh, and you have been way too busy!! I would love to have this fine fabric! It's so lovely! Haha! I was kinda a cheater this weekend - I said I wasn't going to buy any fabric for this "scrap" quilt, but there was a Moda Bake Shop sampler kit with 480 different fabrics already cut into 2.5" squares. I couldn't resist, and had to buy it. That's almost half the squares I'll need! And ALREADY CUT!! But I'll ask nicely if you'll let me cheat with the adorable lecien print as well. Lecein fabric is so darling and I have yet to find much of it in any local shops! This panel is too cute - and what a great way to get a bunch of different hexies. I just may have to be a cheater AND a thief (for stealing this idea!). Thanks for the chance. That is such a cute print, I'd love to have some of it. I added 28 more "real" hexagons to my stash this evening... I'd L.O.V.E. to be a cheater too! Please, please, please! SUCH a great fabric, if I don't win it I'm buying it anyway! But probably not for my hexes... 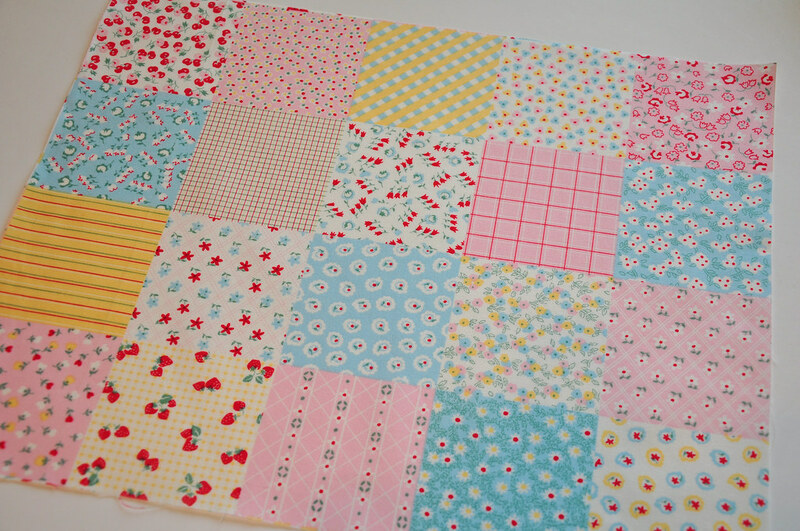 I just want to make a cheater quilt out of it for a little baby girl. Adorable. Oh, that fabric is just darling. The other day I finished cutting up more paper hexagons (about 300 or so) in order to carry on with my new obsession. My husband just doesn't understand! Ok, that print would actually make my dive into the hexagon waters. I'm been hesitating, but I love that fabric. Thanks for the chance. Pretty please with brandy soaked cherries on top? i also dont think its really cheating - they designed it as seperate prints to look like seperate fabrics, so i think that's ok. i havent heard of this make before, but it is very lovely. i've made about 50hexies this week and am now running low, so i'd especially love to not-cheat with you! Wow, thank you so much for offering! It looks really great and would just be a good start to begin with. 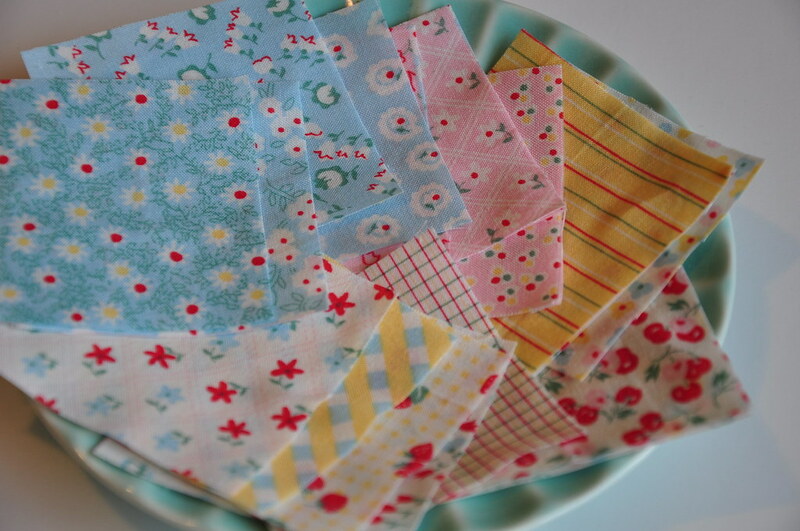 Just found out about your hexi-quilt-along and would be happy to join you! I love your idea and I am lloking forward to it! Cute fabric! I don't think it's really a cheater fabric because it'll still look different. Please...pretty, pretty please...please with sugar...and please with a cherry on top! Okay, that's about the nicest please I could come up with!